Our holy Father Daniel the Hesychast was one of the greatest Saints brought forth by the Moldavian land, a great teacher of the desert and a guide of monks. This Romanian Saint was born at the beginning of the fifteenth century to a family of poor people who lived on the estates of Saint Nicholas Monastery in R?d?u?i. He was named Demetrius at Baptism. He became a monk at this same monastery when he was sixteen years old and was given the name of David. After some years of severe asceticism, he was granted the grace of the priesthood and went to live at Saint Laurence Monastery in Vicoul de Sus commune. Then being called by the Holy Spirit to the life of the desert, he became a schemamonk with the name of Daniel sometime before 1450. At first he lived the ascetic life alone in unknown spiritual labors in the valley of Secu Brook near Neam? Monastery, and then in a small cell carved out of rock in the valley of Putna Creek. After the consecration of Putna Monastery in 1470, Saint Daniel the Hesychast went to live in the vicinity of Vorone? Monastery, where he carved for himself a cell out of rock under Falcon Cliff. He lived the ascetic life here for twenty years, pleasing God, training many disciples, and performing many miracles of healing. At one point, speaking of St Daniel’s call by the Holy Spirit to the desert-dweller’s life, Fr Ioanichie writes, ‘His soul was wounded by the love of Christ and he desired to glorify Him unceasingly with the angels and with the hesychasts who lived in the Carpathian forests.’  I cannot help but pause and reflect here. I first learned of the Carpathians when I read the words of Jonathan Harker in his journal entry from Bistritz on 1 May: ‘I find that the district he named is in the extreme east of the country, just on the borders of three states, Transylvania, Moldavia, and Bukovina, in the midst of the Carpathian mountains; one of the wildest and least known portions of Europe.’  Thus, in my imagination the Carpathians took on a dark, superstitious, even Gothic cast from my very first encounter with them. But more importantly, due to the idiosyncracies of my childhood, it was a landscape that stuck with me. The Carpathians were to me something like what Narnia probably is to many other children. The Holy Trinity parish calendar site seems to have an error here, listing ‘Venerable Daniel the Hesychast of Voronej (17th c.) (Romania)’. 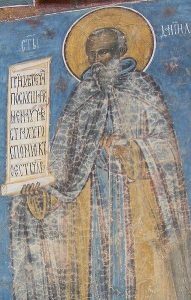 The only Romanian ‘Daniel the Hesychast’ connected with a place-name resembling this one is St Daniel the Hesychast of Vorone?, who lived in the 15th c., and according to Fr Ioanichie, this St Daniel is commemorated on 14 December. Clearly, Holy Trinity has some typos. Bishop Seraphim (Joant? ), Romania: Its Hesychast Tradition & Culture (Wildwood, CA: St Xenia Skete, 1992), pp. 66-7. Archimandrite Ioanichie (B?lan), Romanian Patericon: Saints of the Romanian Orthodox Church, Vol. 1 (Platina, CA: St Herman of Alaska Brotherhood, 1996), p. 190. Petru IV Rare? was a Moldavian voievode of the 16th century. Bram Stoker, The Annotated Dracula, ed. Leonard Wolf, Illust. Stty (NY: Clarkson N. Potter, 1975), p. 2.